PyMongo's New Default: Safe Writes! I joyfully announce that we are changing all of 10gen's MongoDB drivers to do "safe writes" by default. In the process we're renaming all the connection classes to MongoClient, so all the drivers now use the same term for the central class. PyMongo 2.4, released today, has new classes called MongoClient and MongoReplicaSetClient that have the new default setting, and a new API for configuring write-acknowledgement called "write concerns". PyMongo's old Connection and ReplicaSetConnection classes remain untouched for backward compatibility, but they are now considered deprecated and will disappear in some future release. The changes were implemented by PyMongo's maintainer (and my favorite colleague) Bernie Hackett. MongoDB's writes happen in two phases. First the driver sends the server an insert, update, or remove message. The MongoDB server executes the operation and notes the outcome: it records whether there was an error, how many documents were updated or removed, and whether an upsert resulted in an update or an insert. This getLastError call can be omitted for speed, in which case the driver just sends all its write messages without awaiting acknowledgment. 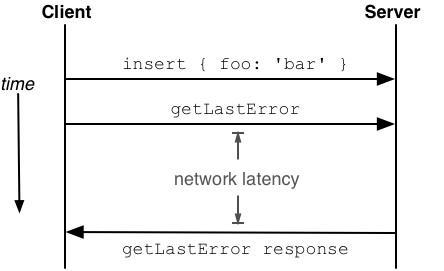 "Fire-and-forget" mode is obviously very high-performance, because it can take advantage of network throughput without being affected by network latency. But this mode doesn't report errors to your application, and it doesn't guarantee that a write has completed before you do a query. It's not the right mode to use by default, so we're changing it now. In the past we haven't been particularly consistent in our terms for these modes, sometimes talking about "safe" and "unsafe" writes, at other times "blocking" and "non-blocking", etc. From now on we're trying to stick to "acknowledged" and "unacknowledged," since that goes to the heart of the difference. I'll stick to these terms here. w=0 is the new way to say safe=False. ReplicaSetConnection is also obsolete, of course, and succeeded by MongoReplicaSetClient. >>> # default empty dict means "w=1"
You can see that the default write_concern is an empty dictionary. It's equivalent to w=1, meaning "do regular acknowledged writes". This is very nerdy, but my personal favorite. The default value for auto_start_request is changing from True to False. The short explanation is this: with the old Connection, you could write some data to the server without acknowledgment, and then read that data back immediately afterward, provided there wasn't an error and that you used the same socket for the write and the read. If you used a different socket for the two operations then there was no guarantee of "read your writes consistency," because the write could still be enqueued on one socket while you completed the read on the other. You could pin the current thread to a single socket with Connection.start_request(), and in fact the default was for Connection to start a request for you with every operation. That's auto_start_request. It offers some consistency guarantees but requires the driver to open extra sockets. ... then the find_one won't run until the insert is acknowledged, which means your document has definitely been inserted and you can query for it confidently on any socket. We turned off auto_start_request for improved performance and fewer sockets. If you're doing unacknowledged writes with w=0 followed by reads, you should consider whether to call MongoClient.start_request(). See the details (with charts!) in my blog post on requests from April. Connection and ReplicaSetConnection will remain for a while (not forever), so your existing code will work the same and you have time to migrate. We are working to update all documentation and example code to use the new classes. In time we'll add deprecation warnings to the old classes and methods before removing them completely. Motor's in beta, so I'll break backwards compatibility ruthlessly for the sake of cleanliness. In the next week or two I'll merge the official PyMongo changes into my fork, and I'll nuke MotorConnection and MotorReplicaSetConnection, to be replaced with MotorClient and MotorReplicaSetClient. We've known for a while that unacknowledged writes were the wrong default. Now it's finally time to fix it. The new MongoClient class lets you migrate from the old default to the new one at your leisure, and brings a bonus: all the drivers agree on the name of the main entry-point. For programmers new to MongoDB, turning on write-acknowledgment by default is a huge win, and makes it much more intuitive to write applications on MongoDB.